1 Samuel 2:1 (AMP) HANNAH PRAYED, and said, My heart exults and triumphs in the Lord; my horn (my strength) is lifted up in the Lord. My mouth is no longer silent, for it is opened wide over my enemies, because I rejoice in Your salvation. Most of the times, when we talk about Hannah’s prayer, we refer to the one she made prior to conceiving Samuel. But today, I want to point you to another of Hannah’s prayers, recorded in 1 Samuel 2, after the Lord had given her a son. Hannah in her deep gratitude to God speaks of how the Lord gives strength to his king and exalts the horn of his anointed(1 Samuel 2:10). The beauty of this is that Israel had not yet expressed its desire for a king but a praying mother saw this before hand; she also had the knowledge that her son would be instrumental in this great kingdom milestone. It is an undisputed fact that Samuel was very important to the kingship: he anoints Saul, he is the voice of God to Saul’s throne. When Saul is disqualified, he anoints David and even after his death, he is considered too important that his spirit has to be invoked to give counsel to the king. What a man! It all started with a praying mother, who did not only ask for a child but one with purpose. She looked past her time to when the nation would desire a king and understood her part as the mother of the man who would be qualified enough to lay hands on the first king and on God’s ultimate choice of king. Children are every parent’s opportunity to change the world. 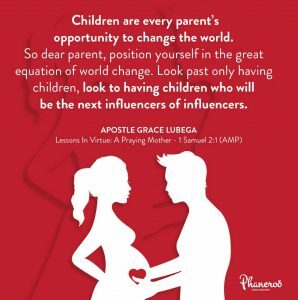 So dear parent, position yourself in the great equation of world change. Look past only having children, look to having children who will be the next influencers of influencers. See your child as the one whom the presidents and the kings of this world will seek counsel of, even before that child is born. See past now to the future needs of the nations and place your child in that equation. Hallelujah! PRAYER: Father, I thank you for this Word. Thank you for the great responsibility of parenthood. I know what it requires of me and execute it with diligence and the guidance of the Holy Spirit. My children are for signs and wonders, they guard the gates and are a crown to me all the days of my life. In Jesus’ name. Amen.